With a name promising excitement and innovation, Bladerunner Boats has set itself a high benchmark. Fortunately, its products deliver. 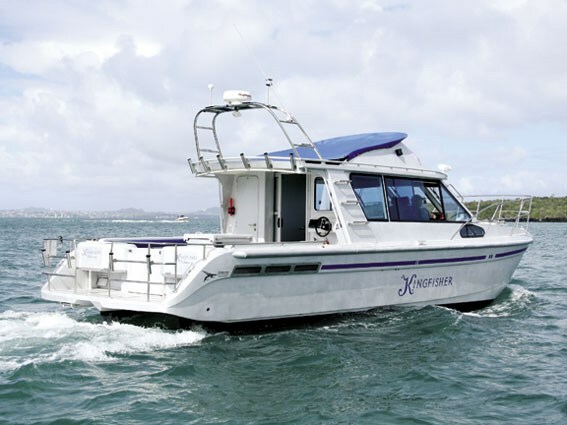 Established in 1992, Kumeu-based Bladerunner Boats is a family-owned builder of custom alloy boats. The company specialises in power catamarans featuring a hydrofoil blade between the hulls. Standard models range from 6m to 12m in length, although other sizes have been produced. While every Bladerunner boat is a custom project, it's based on a proven design concept. Director Greg Shine has developed all the designs in-house using the Maxsurf 3D CAD program. This software allows him to check the floating hydrostatics and stability of the designs, then convert all the hull parts and frames to cutting plans. All parts are precision-cut on CNC machines. Shine says computer aided design also allows details such as interior joinery and even accessories like winches and fairlead to be predesigned. This in turn saves time and costs, and also allows the building process to progress quickly. The company's most recent model is an 11.2m Sportfisher. As with all Bladerunner boats, it features a number of custom designs for the owner, who will base her for private use in Mahurangi. She's a handsome vessel, and because of the intended usage (fishing), the owner has elected to leave the aluminium unpainted – apart from some blue trim which nicely offsets the grey alloy. The catamaran configuration provides a vast amount of usable flat area, and the boat's fishing pedigree is immediately apparent. A full-width cabin stretches about two-thirds down the length of the boat, leaving a huge cockpit space. 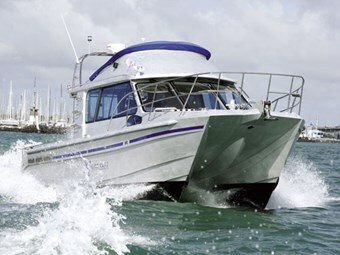 The large, flat foredeck is protected by high and sturdy guard rails, providing a secondary fishing platform. An open sundeck (with a wind fairing) has been built on the roof of the cabin, with access via ladders on either side. A radar arch holds the various aerials and hides a rocket launcher rod holder along the rear of the cabin. Once underway, the effect of the special hardware between the hulls becomes evident. At planing speed the hydrofoil blade starts to bite, lifting the hull even further out the water and smoothing the ride. Although the foil is fixed in the hull, it is "dynamically adjustable" when under way by using the trim controls on the drive system. This allows the trim angle of the boat and foil combination (and hence the amount of lift) to be varied. This enables a more bow-up or bow-down position to be selected according to the prevailing conditions as well as allowing compensation for weight distribution. The effect of the hydrofoil is akin to "flying" through the water. The ride is smooth, eliminating much of the crash and bang of conventional hulls beating through swells. Catamaran hulls generally allow higher effective speeds to be maintained through adverse sea conditions and the foil further enhances this ability. The hydrofoil also compensates for the typical catamaran's disconcerting tendency to lean outwards during tight turns. It keeps the hull fairly level through most manoeuvres. Top speed is a respectable 30 knots fully laden, not bad for a boat that weighs around 6.5 tonnes. Total horsepower from the twin Steyr turbo diesels (driving Mercruiser Bravo sternlegs) is 472hp (2 x 236hp). Fuel consumption at cruising speed (25 knots) is claimed to be around 70 litres/hour. Access to the engines is through large waterproof hatches in the cockpit deck, providing ample service room. Bladerunner builds a top quality boat. From the boarding platform at the stern to the anchor fairlead up front everything is solid, well constructed and thoughtfully laid out. The cockpit's designed for serious fishing and minimal maintenance. Self-draining through large scuppers, it can be cleaned in a matter of minutes with a hose. A sizeable boarding platform is protected by a guardrail (fitted with additional rod holders) that turns it into a very useful extended fishing platform. An oversize transom door allows those big fish to be pulled onboard (it's also a great water-entry point for divers). 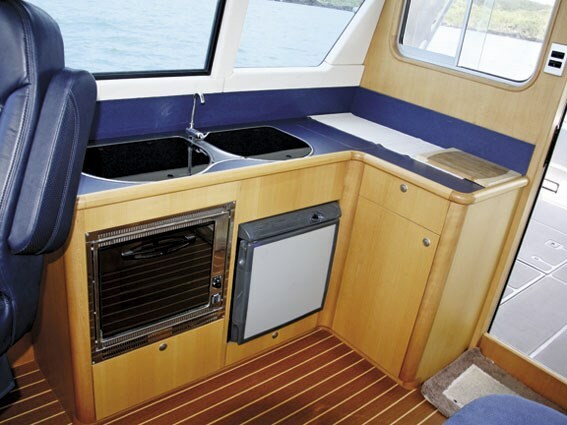 A large livebait tank, with the popular viewing window option, is set into the port transom while the starboard side has a washdown basin and a wet locker. Higher-than-average gunwales feature padded thigh-rests to absorb the stress when fighting big fish. Mounting points for downriggers are installed in each corner and on either gunwale. Centre-stage in the cockpit is a chilled bait/catch station. Set at a comfortable working height, this features a textured worktop that slides back on runners. Two refrigerated storage bins under the worktop can keep either the bait and/or the catch chilled. A fold-down bench seat at the rear of the unit provides extra seating space. An auxiliary helm station on the starboard side of the cockpit allows the skipper to remain close to the action while controlling the boat. An Interphase forward-looking sonar unit is fitted at this station, while the chartplotter/fishfinder screen of the main helm is visible through a window. On the left side of the cockpit is a shallow but full-height storage locker. It contains a wide range of fishing gear and dive bottle racks at the bottom. The locker also hides the sliding door into the main cabin, a sensible option that ensures there is no swinging door to worry about in bad weather. Stepping inside the cabin the emphasis switches from hard-core fishing to practical comfort, with plenty of headroom. Immediately on the port side is the smallest room with its own large tinted viewing window. A hand-flushed Jabsco toilet takes care of the necessary with a hand basin and running hot and cold water. On the starboard side is the galley with its spacious layout. Its position (behind the helm) is an unusual configuration, but in this case the helm station in the cockpit required an uncluttered view through the front windscreen. The galley has a twin-burner gas hob, full oven, fridge and sink with hot/cold water. 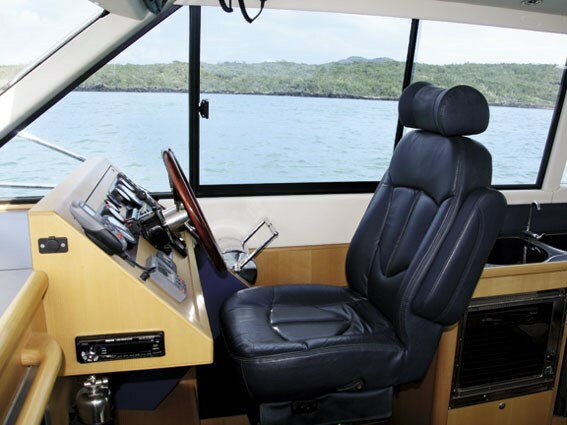 The master helm station has a leather-upholstered skipper seat (gas-strut mounted). In addition to the gauges for the Steyr diesels, dash electronics include a Raymarine autopilot. This model includes a wireless remote unit which allows the skipper to control the boat when he steps away from the helm. Mounted in the ceiling is a large Raymarine C320 integrated display, which includes GPS, fishfinder, chartplotter and radar. A second Interphase forward-looking sonar display unit is mounted next to it, as well as an ICOM VHF radio. A Boss stereo CD player and radio provides for light entertainment, playing through cabin speakers. The cabin interior is finished in attractive timbers (teak, holly and cherry). All lockers have rounded corners, and innovative drawers under the bench seat makes optimum use of space. The dining table seats five people in leather-upholstered comfort. A double bunk in the port hull steps up to a diagonal single bunk across the width of the boat. A queen-sized double berth across the boat on the starboard side completes the sleeping accommodation. Out on the forward deck a large anchor bollard welded to the hull should hold the boat through any conditions. The boat is designed for single-handed operation and a fully automatic anchor winch is a necessity. Latched hatches under the foredeck give access to the anchor well as well as storage space for additional anchoring equipment. Constructed in 5mm alloy plate, the hull is double-skinned up to the chines with foam-filled sections between the skins. There are multiple crash bulkheads and no less than 12 separate buoyancy areas, each individually sealed. Although this particular boat has not been built to survey classification, this is available as an option. Plenty of sound-deadening material has been laid on the inside of the hull to soften water noise. Throughout the boat are clever design features that reflect the years of building and boating experience. A wooden ceiling-mounted rod holder in the main cabin (a work of art in itself) is located so that the rods will not be in anyone's way. Spotlights are mounted not only in the cockpit but also facing forward so the skipper can pick up a mooring in the dark. Grab-handles are evident throughout the boat, including the front deck, so passengers always have a convenient hold. This would be a good boat even without the hydrofoil blade – the superior ride provided by the hydrofoil elevates it to a great boat. Anyone looking at this size vessel needs could do worse than take a Bladerunner for a test drive before making a buying decision.